I received a call from the manager of the molding department at a car battery manufacturer. His team had a major issue with one of their plastic molding machines. Water had contaminated its lubricating oil and caused the equipment to unexpectedly break down. Apparently, the water got into the oil reservoir through a leak in a heat exchanger. The water reduced the lubricity of the hydraulic oil, which then caused the oil pump to fail and eventually the entire machine shut down. When the maintenance crew inspected the machine, they noticed a bunch of free water in the lube oil reservoir and plumbing system, which immediately alerted them to a water contamination problem. This equipment failure cost the company thousands of dollars per day in lost revenue. It was a urgent to say the least. Several months prior the same manager had informed me that they occasionally have problems with moisture in their hydraulic oil. At that time I let him know that we offer vacuum dehydrators for rent and for sale. 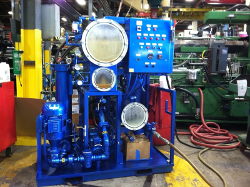 Now that they had an immediate need I suggested that they rent a 20-GPM vacuum dehydrator with a variable-frequency drive in order to purify and dehydrate their lube oil of the molding machine ASAP. I was actually out of town on business during this whole process, so I was glad to coordinate everything with our reliable customer service team. Since this was an emergency for the company we made sure to ship the unit right away. Shortly after the manager received the dehydrator, I received some very positive feedback from him. He reported that approximately 30 gallons of water were removed from 750 gallons of hydraulic oil and that the molding machine was back to normal operation. Success once again! Do you have a question about lube oil filters or vacuum dehydrators? Feel free to contact us anytime. Our friendly team of experts will be happy to help you out with your particular issue.